A new method allows the quantum state of atomic acknowledgments – the basic unit of information in quantum computers – measured by twenty times less error than previously possible without losing any atoms. Accurate measurement of qubit states analogous to the one or zero state of bits in traditional computing is a crucial step in the development of quantum computers. A paper describing the method of scientists at Penn State appears on March 25, 2019 in the journal Nature Physics . "We're working on developing a quantum computer that uses a three-dimensional array of laser-cooled and captured cesium atoms as qubits," said David Weiss, a professor of physics at Penn State and head of the research team. "Because of how quantum mechanics work, the atomic receivers can exist in a" superposition "of two states, which means that they can somehow be in both states at the same time. Each measurement finds each atom in only one of its two possible states. The relative probability of the two results depends on the superposition state before measurement. " To measure the qubit states, the team must first use lasers for to cool and trap about 160 atoms in a three-dimensional grid with X, Y and Z axes. Initially, the lasers trap all the atoms identical, regardless of their quantum state. The scientists then rotate the polarization of one of the laser beams creating the X-grid, which spatially moves atoms in a qubit state to the left and atoms in the second qubit state to the right. If an atom starts in a superposition of the two qubit states, it ends in an overlay of having moved to the left and has moved to the right. They then switch to an X grid with a smaller grid distance that captures the atoms in their new overlay of shifted positions. When the light is then spread from each atom to observe where it is, each atom is either shifted to the left or shifted to the right, with a probability that depends on its original state. 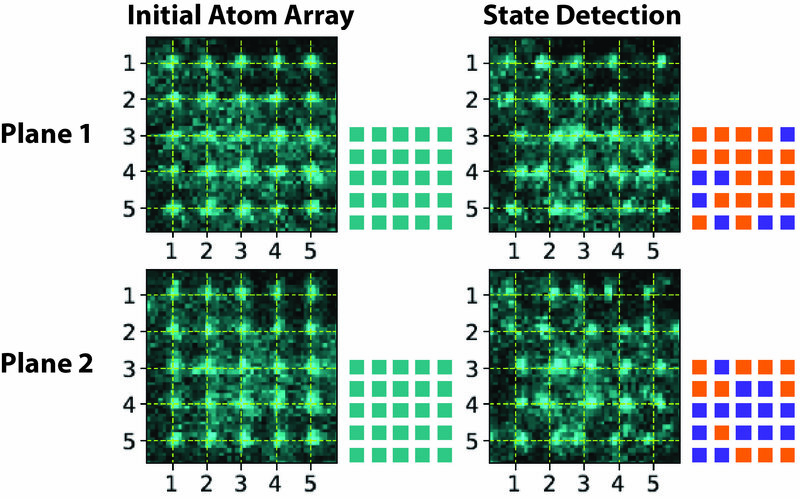 Measurement of each atom's position corresponds to a measurement of each atom's first qubit state. "Mapping internal states at spatial locations goes a long way towards making this an ideal measurement," Weiss said. "Another advantage of our approach is that the measurements do not cause any loss of any of the atoms we measure, which is a limiting factor in many previous methods." The team determined the accuracy of their new method by placing their grid with atoms in either qubit or mode and performing measurement. They were able to accurately measure states with a credibility of 0.9994, meaning that there were only six errors in 10,000 measurements, a twenty-one improvement on previous methods. In addition, the error rate was not affected by the number of qubits the team measured in each experiment, and because there was no loss of atoms, the atoms could be reused in a quantum computer to perform the next calculation. "Our method is similar to the Stern-Gerlach experiment from the 1922 experiment, which is integrated into the history of quantum physics," says Weiss. "In the experiment, a ray of silver atoms passed through a magnetic field gradient with their north poles directed perpendicular to the gradient. When Stern and Gerlach deflected half of the atoms up and down, it confirmed the idea of ​​quantum superposition, one of the defining aspects of quantum mechanics. In our experiment, we also map the inner quantum states of atoms at positions, but we can do it on an atomic basis. Of course, we don't have to test this aspect of quantum mechanics, we can just use it. "